An article published in the SPIE journal Optical Engineering, "Arbitrary spectral matching using multi-LED lighting systems," marks a substantial advance in lighting science and technology. 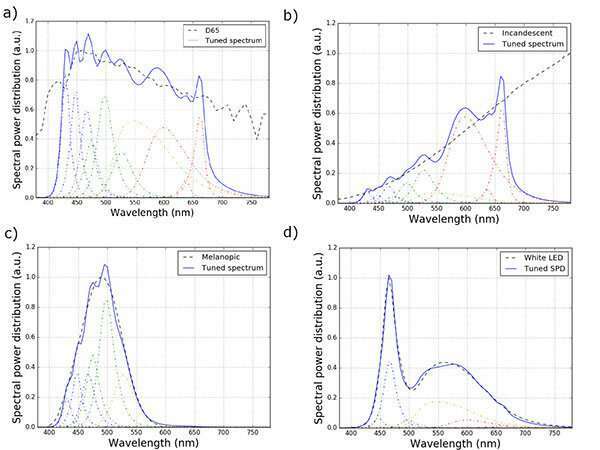 In their paper, the researchers announce a two-pronged approach to both measure and self-adjust the spectral power distributions (SPDs) of LED lighting systems. Their methodology demonstrates the system's ability to maintain consistency and stability over an extended period of time. Solid State Lighting (SSL) can be used to enhance our vision, sleep patterns, and wellbeing. SSL benefits are evident across their wide use in residences and offices as well as across industrial and commercial sectors, including the ongoing development of applications in medicine, imaging, agriculture, communication, transportation, and museum lighting. Some of these applications require highly precise light spectra that don't produce optical power variations or shifts in color over time. The open-access paper addresses two challenges: how to keep temperature changes and age-based deterioration from impacting a light emission's strength, consistency, and color, as well as providing a reliable, internal, self-monitoring method. The authors use a fast-computation, high spectral fidelity algorithm to determine channel weights of a targeted SPD; in conjunction with that method, an internal microprocessor provides a closed-loop control system that monitors and corrects the spectral output, compensating for shifts due to temperature changes or LED wear and tear. The authors' use of a general framework for multi-channel SSL systems, ensures the universal applicability of their findings across different lighting technologies. According to Optical Engineering Associate Editor, SPIE Senior Member, and U.S. Air Force Research Laboratory Technical Advisor Daniel A. LeMaster, the research showcases significant advances in terms of lighting technologies, "This method to monitor and quickly compensate for the colorimetric issues that arise from junction heating and LED aging will be of great utility in the global LED lighting market."